SolteraTop is a browser add-on which can supposedly enhance your browsing experience. However, this application is categorized as adware because of annoying advertisements that are displayed when browsing the Internet. SolteraTop is available at solteratop.info and works on Internet Explorer, Google Chrome, and Mozilla Firefox. It is identical to Outobox, LinkiDoo, and many other adware programs which can supposedly make your browsing more enjoyable. Do not worry if you have installed SolteraTop on the PC, because here you will learn how to remove it from the computer, and the sooner you do it, the better. SolteraTop is supported by numerous advertisers, which is why you can use a free service. The application is capable of displaying pop-ups, pop-unders, in-text advertisements, iframe of displays, web banners, and other ads. The content of the advertisement varies greatly and it depends on the advertisers. You may be invited to take part in a survey or a sweepstake, download a computer application, browse a shopping website, or get involved in some other activity. The ads that you find on the screen are provided from various advertising domains. You can notice that by clicking on the ad and watching the address box or the browser tab. It is important to note that SolteraTop is not affiliated with those advertising domains; it does not endorse the ads and the websites to which you are taken, which means that you interact with the application at your own risk. A simple piece of advice when dealing with the third-party websites would be not to expose your personal information if you do not know the website. Do not download computer programs if you are not sure whether they are legitimate and reliable. You will be responsible for the consequences if the computer gets infected, so if you do not want to risk your privacy, remove SolteraTop right now. Additionally, you should bear in mind that SolteraTop monitors your online behavior. It records your search terms, the URLs of the websites that you access, the date and time you spend on those websites, and other anonymous information. The company may use browser cookies, pixels, web beacons, and other tracking techniques. The information is said to be used for business purposes, including the production of new, more personalized advertisements that are related to your interests and browsing patterns. 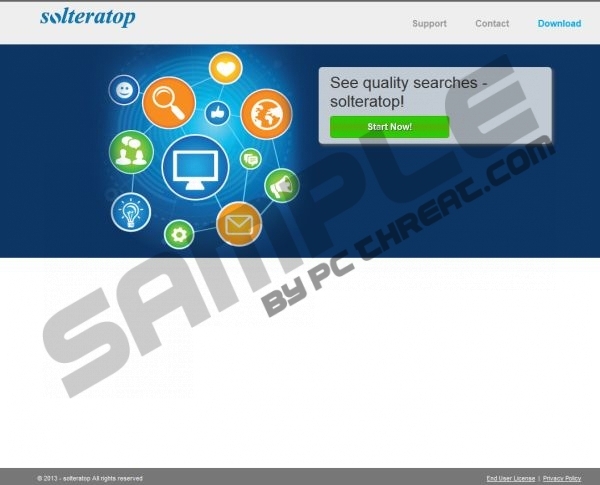 If you do not want to find new targeted ads, remove SolteraTop from the PC in order to browse the Internet as usual. The removal of the unwanted adware program can be easily carried out by a spyware removal tool. We recommend that you implement SpyHunter because it can eliminate the unwanted application and safeguard the system from computer infections. You do want to be safe on the Internet? So do not wait any longer and take action right now. Move the mouse pointer to the lower-left corner of the screen. Right-click and select Control Panel. Click Uninstall a program and remove SolteraTop. Uninstall the unwanted adware program. Click the Start button and then click Control Panel. Quick & tested solution for SolteraTop removal.